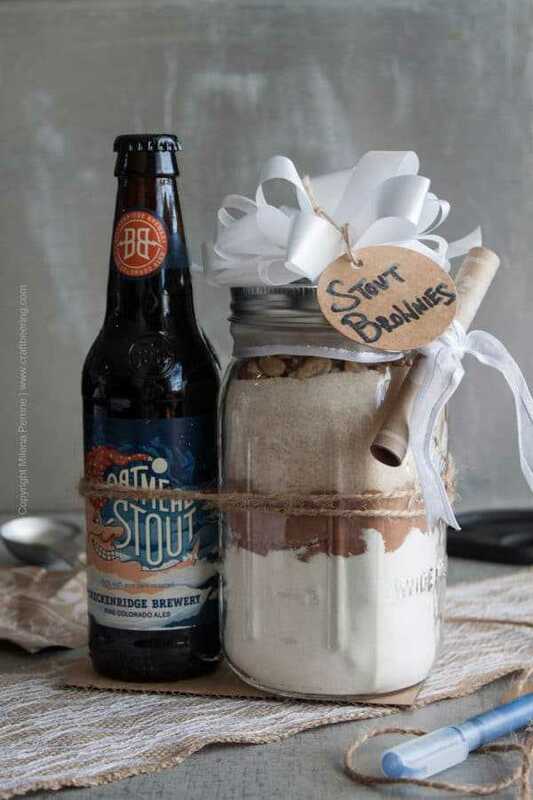 A stout brownie mix nicely layered in a mason jar and presented with a bottle of stout makes a great DIY gift for craft beer fans with a sweet tooth. It is as much fun to prepare on the part of the giver as it is to use on the part of the receiver. Take a look at this mix for stout brownies with walnuts. How cool would it be to put one together for a friend? 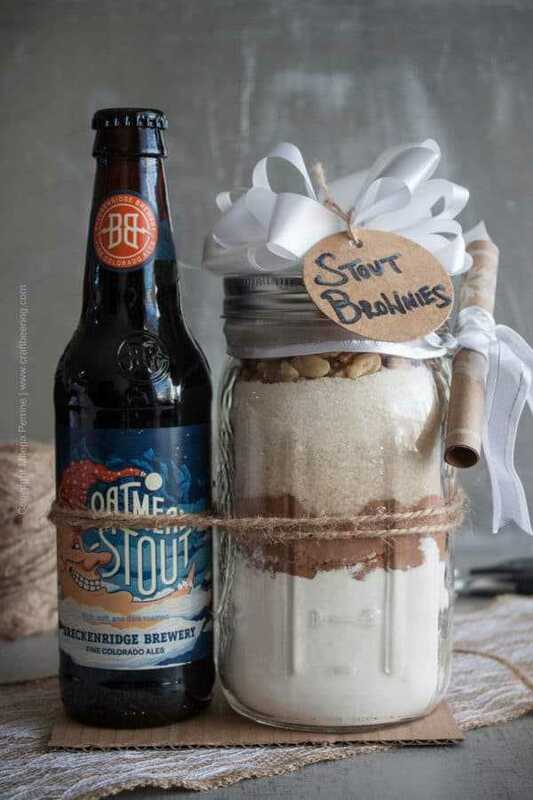 This week I made a few stout brownie mix sets like it for hostess/symbolic Christmas gifts and I just published the beer brownies recipe they are to be used for. (The recipients will have to add butter, eggs and vanilla extract to the stout brownie mix and beer). The brownies end up with a cakey texture as shown below, but I also include adjustments to the base recipe for fudgy brownies. When measuring out the dry ingredients to layer in the mason jar you can easily make these adjustments. As a general rule of thumb when selecting the ale to partner up with this stout brownie mix go with a well balanced stout without excessive bitterness. This means without too much roasted barley in the grain bill and not aggressively hopped. For example this Breckenridge Oatmeal Stout. At the same time if you feel like you know the taste preferences of the gift recipient you can customize. Choose a chocolate or vanilla stout if you feel they will fit the bill better. Maybe they are a total hop head and would enjoy extra hoppy bite in their beer brownies? Then choose an imperial stout. When layering the dry ingredients, go with the flour layer first and pack it down with the back side of a small ladle or a spoon. Next add the cocoa powder, then the sugar and finally the chopped walnuts (or other nuts of your choice, or perhaps chocolate morsels?). Work carefully. You can get as creative as you like when it comes to decorating the jar and packaging the gift. 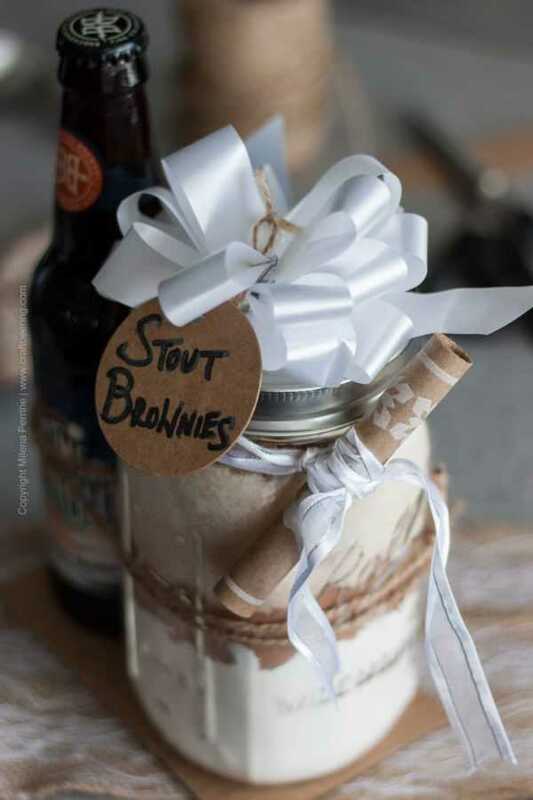 I like things simple so all I did was cut out an appropriately sized piece of cardboard to use as a base for the beer and the jar with the stout brownie mix, tape each vessel to it and bind them with twine. Then they can easily be inserted inside a clear gift bag or a gift box and presented. ribbons, tags etc. to decorate the set and a small piece of paper to hand write the recipe on. (Or you can simply write out the link to the recipe). Once again – I recommend that you begin by deciding on a cakey or fudgy texture for the brownies. If cakey, use the base recipe (will add baking powder and use more flour). If fudgy, make the adjustments (no baking powder and less flour). The instructions will also reflect a difference in using one and a half stick of butter (for fudgy brownies). Other than that – it is a breeze! Stout Brownies with Walnuts Recipe. Cheers! This is so neat and different. I think my 22 year old would love if I gave it to him. Mmmmmm. Oatmeal Stout is perfect in brownies, and I can’t wait to give this version a try. I might even give a few away…but only if I reaaaaly like the recipient. ☺️ Thanks so much for sharing at the #happynowlinkup! 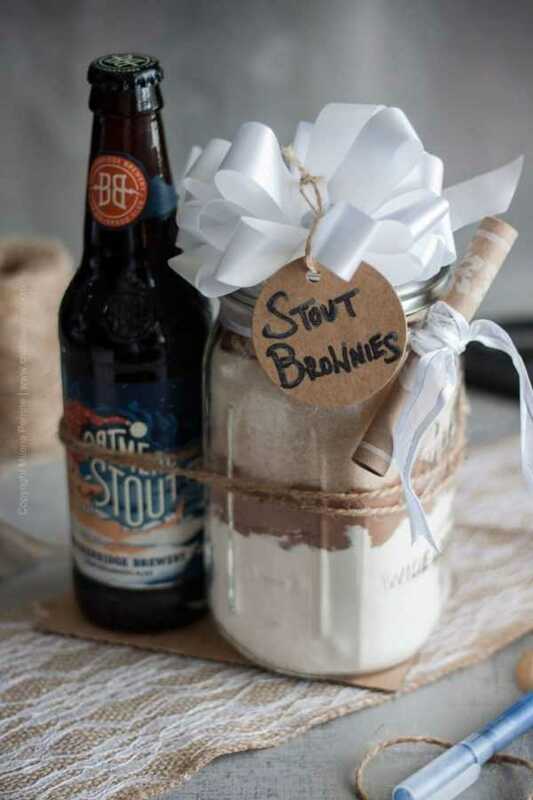 I don’t know any Stout people, but I should love the brownie idea. Thanks for sharing on Sunday’s Best. What a great gift idea! I will give this a try for the stout fans on my list! Thank you for sharing this. Love this gift idea! This is happening next Christmas! this is aweseom! love it! DIY food gifts are the best hey! Thank you for stopping by Roseann! It would be totally cool if you would put this gift together for me! Seriously, this is such a great gift idea! 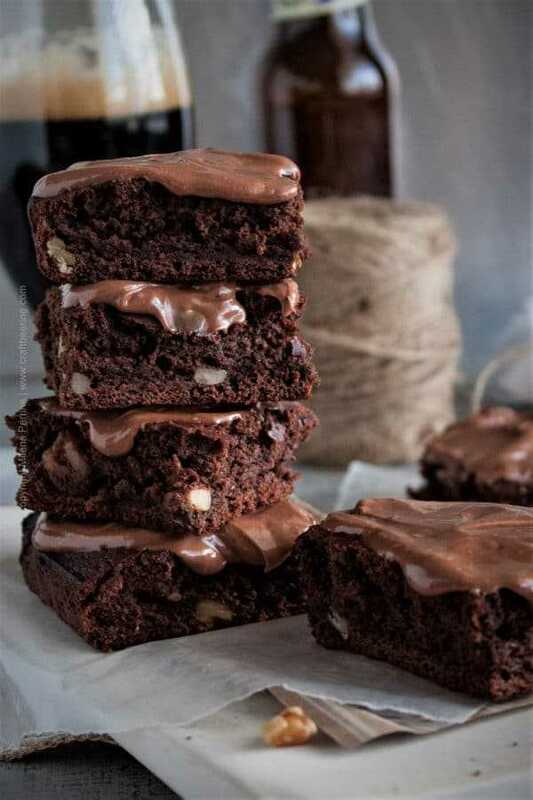 I’ve got some Brekenridge Vanilla Porter on hand that would be amazingly delicious in these brownies! Cheers! I bet the Vanilla Porter will be delicious in this recipe! Cheers Rachelle! Done! Thank you so much, Jess! This is such a perfect gift idea! I’m totally doing this for my neighbors. I just don’t think I can get the packaging to look as cute as you did :). Have a great week! This is a wonderful idea! I have a number of friends who I know would just love this!! Thank you:) I bet he would love the gift even more if you make the brownies, lol! What a fun idea!! I’m using this for our gift exchange! Thanks you for sharing at the What’s for Dinner Party!